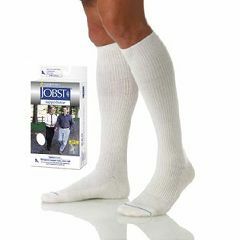 SensiFoot Over-the-Calf Support Socks is designed for people who experience decreased nerve sensation caused by diabetes or foot pain from arthritis. Has mild, nonrestricting, gradient compression. Antimicrobial finish inhibits fungal and bacterial growth on sock. Moisture wicking fiber helps to keep feet dry throughout the day. Soft padding in foot and toe areas protects against pressure points and reduces friction. Available in White. Order by shoe size. 1 pair. Travel. Around The House. Daily Use. Athletics. I'm on my feet all day and came home with tired, painful legs. Since I've been wearing these socks, my legs don't hurt! Wears through the heel. socks unraveling. The Sensifoot over the calf socks which I love and I have noticed of late they have been unraveling, does anyone know if they will cover the cost of replacement of these socks? Can't seem to find any information on coverage. They don't fall down. Attractive Design. Durable. Soft. Comfortable. Diabetic mom. Daily Use. Around The House. These are the ONLY socks I bought for my diabetic mom that don't fall down. They are snug but not tight and go just below her knee. My mom wears size 10-11 womens shoes and the large size fits perfect. I am buying more. My only wish is that they had non slip soles but I solved this by buying non slip ankle socks and putting them on over the long socks (the kind they give you at the hospital works great). My mom always has cold feet so this works well. These socks are great!! I need the calf measurement of these socks in the large and x-large men's size. I have these in white and just love them. Do they come in black .? They come in white, black, brown and navy. I don't own any myself, just read the description. I bought these thinking they were support socks to help my veins. There is a note inside stating the compression is to keep the socks up. What abount my veins?????? They are not that kind of compression. They won't help your veins. Do these socks have a seamless toe? No they don't have a seamless toe.